Federal tax receipts are growing strongly while spending is stagnant, thanks to a deadlocked Congress, a growing tax base, and higher tax rates. The federal deficit as a % of GDP has fallen almost by half in the past 3 1/2 years. This dramatic improvement is likely under-appreciated and almost totally unexpected. At the very least this removes a good deal of uncertainty about the future, at the same time as it removes the need for further tax hikes and increases the odds that tax rates might be lowered in the future. Federal spending has changed very little in the past four years. In the 12 months ended May 2013, spending actually declined 1.1%. 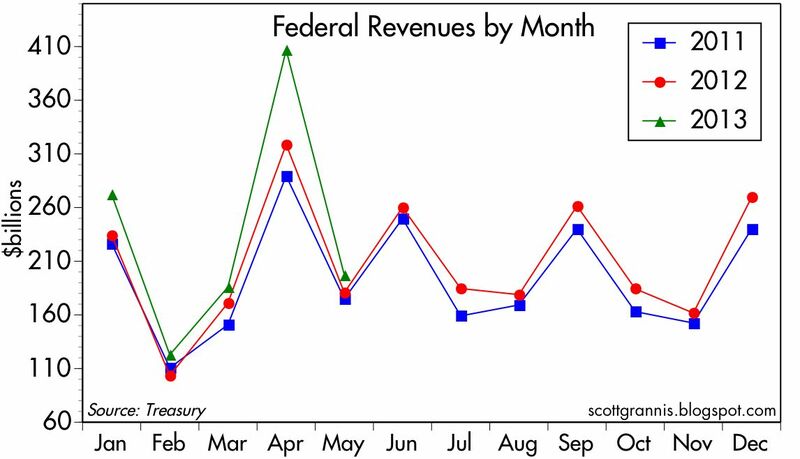 Federal tax revenues have been rising steadily for the past several years, and have surged at a 17% annual rate in the six months ended May 2013. Several factors were responsible: jobs and incomes are growing, the payroll tax holiday expired at the end of last year, income was shifted forward at the end of last year as people attempted to avoid an anticipated increase in tax rates, tax rates on top income earners increased, and a stronger stock market generated more capital gains. 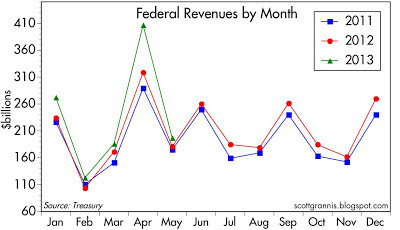 Federal revenues over the past 12 months reached a new all-time high of $2.7 trillion. 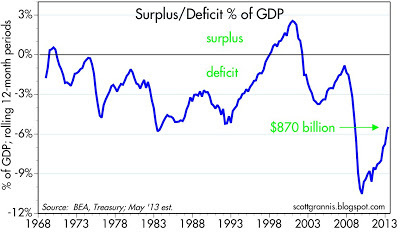 The federal deficit in the past six months was $870 billion, down from a high of $1.47 trillion in CY 2009. 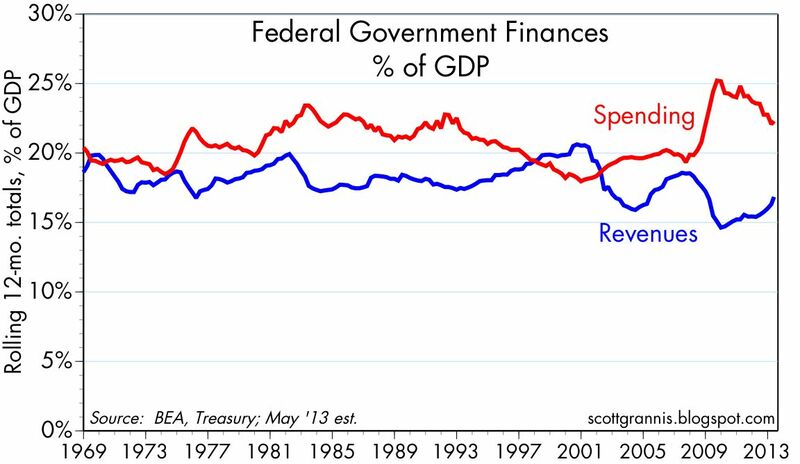 Relative to GDP, the federal deficit has dropped almost by half, from a high of 10.5% to now only 5.5%. Almost all of the nominal reduction in the deficit has come from increased revenues (since spending has been flat), which in turn is mostly due to ongoing economic growth, and partly due to higher tax rates. 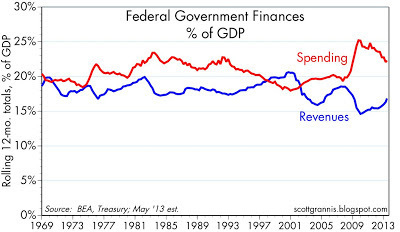 Relative to GDP, 3 percentage points of the 5 percentage point reduction in the deficit have come from the decline in the relative size of government spending, while 2 percentage points have come from the rise in tax revenues. If current trends continue, the budget could end up balanced within 5-6 years. Note to Keynesians: The massive increase in the deficit that occurred from late 2008 through 2009 was supposed to "jolt" the economy back to life, but instead we got the weakest recovery in history. If anything helped get the recovery started, it was the Fed's first Quantitative Easing program, which supplied the cash and cash equivalents that were so desperately needed in a world that had become suddenly very risk-averse. 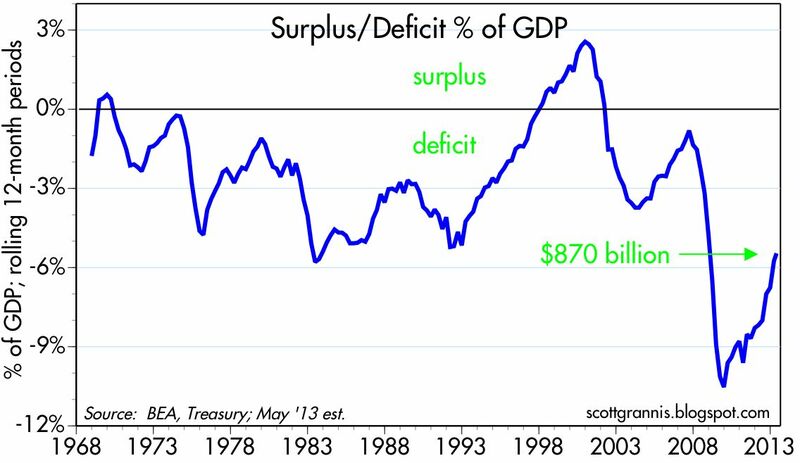 Similarly, the huge decline in the deficit that began in 2010 would have choked most Keynesian models, leading to a painful contraction of economic activity that never occurred. 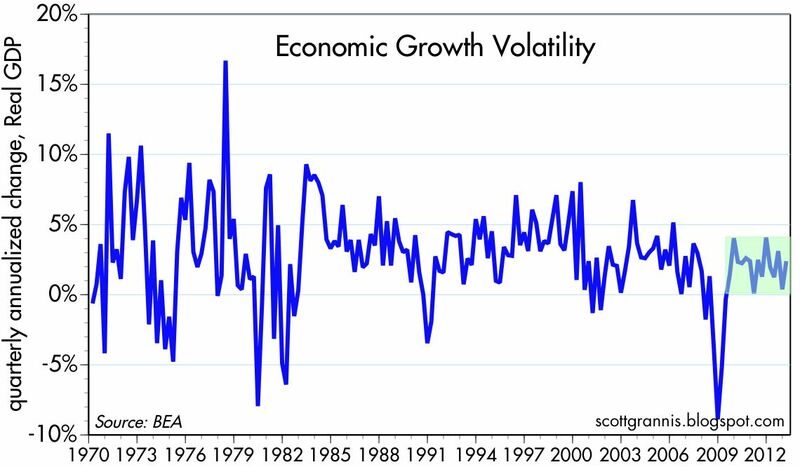 Massive fiscal stimulus was followed by excruciating fiscal contraction, yet the economy grew at a fairly steady and unimpressive pace of about 2% throughout—with surprisingly little variation, as the chart above shows. This recovery has been a perfect laboratory test of the predictive powers of Keynesian economic models, and they have failed utterly. It's time to throw Keynesian economics into the dustbin of history. No doubt, Federalism is thriving albeit at the expense of Main Street USA -- said another way, only the military-industrial complex, the medical establihment, Wall Street, and Federal workers are thriving -- everyone else will be run down by the four horsemen of the apocalypse sometime during the 21st century -- anyone without means has no reason for hope at this point -- only accredited investors or those with world-class skills are welcome in the new economy -- we live in a world of "hunger games" -- the disenfranchised will soon find their lives marginalized as did the American Indians during the 19th century -- I weep for the sufferings to come for ordinary Americans during the 21st century -- most Americans today have every right to live in fear and terror of the establishment and Federalism specifically -- Scott's numbers confirm that Federalism is thriving -- in the meantime, Main Street remains mired in economic depression as evidenced by long-term declines in real working wages, long-term declines in real home values, and long-term declines in the employment to population ratio -- let's hear it for Federalism! 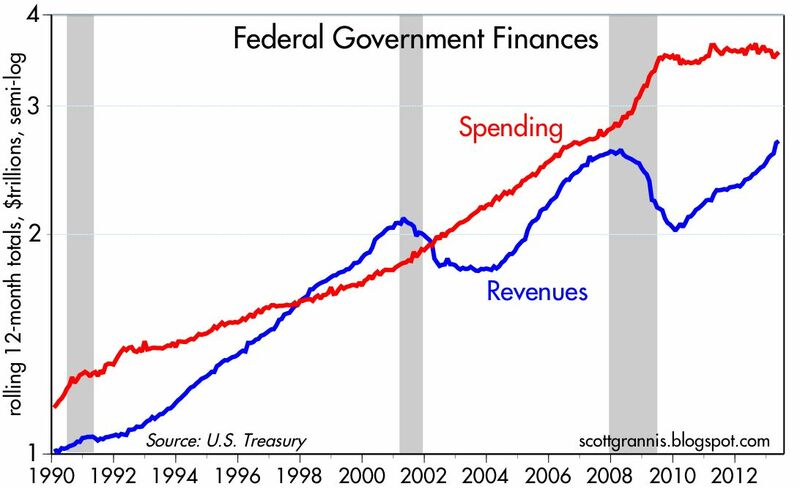 I concur that the effects of federal deficit spending are dubious. In a time of recession, the actions of the Fed are probably paramount. The Fed probably caused the 2008 bust by tightening in response to commodities inflation, though that inflation had little to do with monetary policy. In the decade leading up 2008, China became the globe's largest consumer of many commodities, such as steel. Corn was rising on the USA's mandated ethanol program; oil was rising on China demand and stagnant global production; gold was rising on retail demand in India and China. Of course, is the Fed causes commodities prices to rise, then explain natural gas. Oy why, prior to ethanol, corn became cheaper and cheaper for decades. Thye nice thing about the Fed, is that through aggressive use of QE not only can it reinvigorate the economy, and can pay down our too-large national debt. The Central bank's 1st QE operation could have been supplanted with tax reductions, which would have produced even better and longer term results..
Ben Jamin, how does the action of the fed (qes) pay down the national debt? 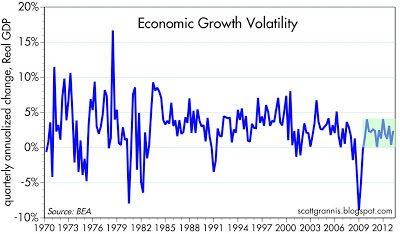 06/10/2013 - Composite leading indicators, designed to anticipate turning points in economic activity relative to trend, point to moderate improvements in growth in most major economies. The United States and Japan are the only countries where the CLIs point to economic growth firming. In other major economies, the CLIs point to limited growth momentum. In the Euro Area as a whole, the CLI continues to indicate a gain in growth momentum. In Germany, the CLI shows that growth is returning to trend. As in April and May, the CLI points to a positive change in momentum in Italy. In France, the CLI does not indicate any change in momentum. The CLIs for the United Kingdom, Canada, China and Brazil point to growth close to trend rates. The CLI indicates that growth is losing momentum in Russia, whereas for India, it continues to indicate growth below trend. Second week of bond fund outflows. Huh. What massive increase? The year over year growth rate in government total spending from late 2008 through 2009 is barely perceptible. 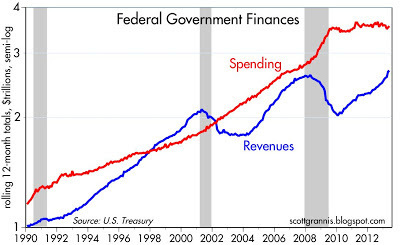 Don't conflate federal deficits with total government spending! This dramatic improvement loans is likely under-appreciated and almost totally unexpected.